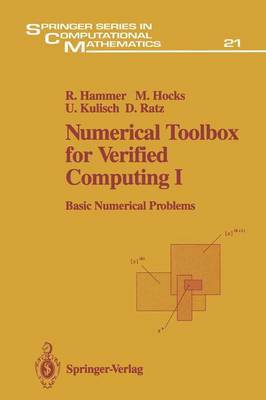 As suggested by the title of this book Numerical Toolbox for Verified Computing, we present an extensive set of sophisticated tools to solve basic numerical problems with a verification of the results. We use the features of the scientific computer language PASCAL-XSC to offer modules that can be combined by the reader to his/her individual needs. Our overriding concern is reliability - the automatic verification of the result a computer returns for a given problem. All algorithms we present are influenced by this central concern. We must point out that there is no relationship between our methods of numerical result verification and the methods of program verification to prove the correctness of an imple~entation for a given algorithm. This book is the first to offer a general discussion on * arithmetic and computational reliability, * analytical mathematics and verification techniques, * algorithms, and * (most importantly) actual implementations in the form of working computer routines. Our task has been to find the right balance among these ingredients for each topic. For some topics, we have placed a little more emphasis on the algorithms. For other topics, where the mathematical prerequisites are universally held, we have tended towards more in-depth discussion of the nature of the computational algorithms, or towards practical questions of implementation. For all topics, we present exam- ples, exercises, and numerical results demonstrating the application of the routines presented.